Galloway’s historic Bladnoch distillery has restarted production of single malt whisky, after spending the last decade in mothballs. The Lowland distillery, which was founded on a family farm in 1817, has undergone an extensive £5m refurbishment, funded by new owner David Prior. The Australian entrepreneur and owner of the five:am yoghurt brand was inspired to purchase the silent distillery in 2015 and give Bladnoch a new lease of life. In the two years since its purchase, Bladnoch’s buildings have been completely renovated and new distilling equipment installed, including two additional stills that will help double the site’s previous capacity. Ian Macmillan, master distiller at Bladnoch, filled the distillery’s first casks – first-fill Bourbon and Sherry butts – in mid-June, with spirit described as ‘grassy and malty… a classic Lowland style’. The distillery is also set up to produce a peated style in the future. While the new make spirit is maturing, Bladnoch intends to release a series of limited edition single malts using 2,500 casks of stock acquired by Prior when he bought the distillery. The first Bladnoch malt featuring the distillery’s modern spirit will be released in 2020, as a no-age-statement vatting of older stocks and three-year-old whisky. Gavin Hewitt, former CEO of the Scotch Whisky Association and non-executive director of Bladnoch, said the distillery would not be offering a cask purchase scheme while its whisky matures. ‘We’re a start-up, but we’re not a start-up because, unlike a lot of new distilleries, we actually have stock, so we don’t need to offer casks to provide cash,’ he added. The distillery launched three new Bladnoch expressions in January this year – a no-age-statement called Samsara, a 15-year-old named Adela, and a 25-year-old named Talia. The three were designed to ‘signify a new lease on life’ for Bladnoch, in terms of taste, look and feel. Bladnoch also plans to release a limited edition single cask bottling of the oldest cask in its stocks to mark its 200th anniversary later this year. The distillery will not be open to visitors until spring 2018, when a full exhibition area, restaurant and tasting experience will be completed. The distillery anticipates receiving more than 25,000 visitors in its first year. The layout of the distillery has already been altered in an effort to provide a quality experience for future visitors. Hewitt said: ‘A great deal of the floorplan was frankly chaotic, so we’ve… carefully redesigned it to ensure a better flow for visitors. Hewitt added that, while the buildings are 200 years old, Bladnoch is now operational as a ‘modern Scotch whisky distillery’. ‘When we bought it the equipment was in an absolutely dreadful condition. Had we started distilling with what we had, we would have had major accidents on our hands. We ripped everything out so the production equipment is 99.99% brand-new. Distilling started at Bladnoch in 1817, when John and Thomas McClelland began producing whisky on their family farm. The site passed through many hands, including Inver House Distillers, Arthur Bell & Sons and United Distillers (eventually Diageo), until it was acquired by brothers Colin and Raymond Armstrong in 1994. The pair had initial plans to transform the site into a holiday village, but changed their minds and began distilling again at Bladnoch. Production was intermittent, and Bladnoch was mothballed in 2009. 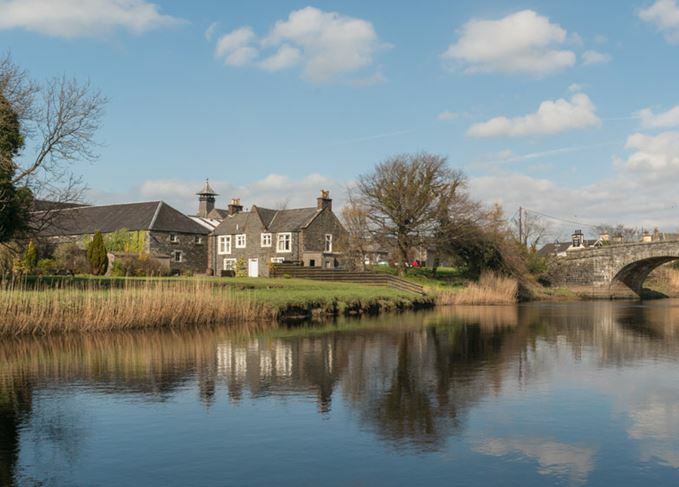 To discover more about Bladnoch’s history and its current set-up, visit Whiskypedia. Plans for new distillery, microbrewery and visitor attraction will be considered by local council.